Pieces by a number of dance professors and undergraduate students will resonate throughout the University Theatre Center during the Dance Spectrum Concert Thursday through Saturday (May 1-3). Performances will be held at 8 p.m. each day, with a 2 p.m. Saturday performance, in the UTC’s Mainstage Theatre. The “Resonant Dance Spectrum Concert” will feature styles ranging from French romantic ballets to jazz dances set to music by Prince and Miles Davis. The concert will include the world premiere of a “religious contemplation” choreographed by associate dean Dana Nicolay. “Of Faith and Spirit,” with music by Rachmaninov, Glass, Vivaldi, Waits, and Faure, attempts to address “the interplay between religion and spirituality—religious tradition versus the individual experience of the divine," according to Nicolay. "I think that people who are trying to understand what is happening in this life, constantly struggle to find a balance between these,” he said. “Each individual life is a unique expression of divine creativity and should be lived as such. Yet, in isolation, our lives become meaningless. Tickets are $10 for general admission and $8 for senior citizens and students with an ID. For more information, or for reservations, call the Dance Box Office at 936.294.3988. Norma Mouton, University of Houston doctoral student and instructor, will discuss the prose and poetry of Spanish writer Pilar Paz Pasamar, as well as her work on the "Recovery" Project at UH on Tuesday (April 29). The foreign language speaker series lecture will be held from 12:30-2 p.m. in Evans Building Room 320. Mouton is currently completing her dissertation at UH on the autobiography of conversion in U.S. Hispanic literature. She earned her master’s degree from the University of St. Thomas and her bachelor’s degree from the University of Texas at Austin. Among her published works is an interview with Pasmar, on whom she teaches a class at UH. Throughout her career, Mouton, who has studied nine different languages and lived in six different countries, has taught at the University of St. Thomas, at Humble’s ninth grade campus, in Norway and taught English as a second language to military personnel at the Lackland Air Force Base in San Antonio. She also served as a research assistant with UH’s “Recovering the U.S. Hispanic Literary Heritage Project,” a national Arte Público Publishers program that locates, identifies, preserves and make accessible the literary contributions of Hispanics in America from colonial times through 1960. The event is free and open to university community. The university community will have the opportunity to say goodbye to associate vice president for Finance and Operations Jacque Gilliam, who will say goodbye to SHSU after 38 years of service on Wednesday (April 30). Her retirement reception will be held from 2-4 p.m. on that day in the Peabody Memorial Library. A Bearkat since the 60s, Gilliam earned both her bachelor’s and master’s degrees in mathematics from SHSU in 1967 and 1969 respectively. After working as the internal auditor for the University of Texas Health Science Center in Houston and the Arkansas Department of Corrections, she returned to SHSU in the same capacity in 1979. In 1981, Gilliam became director of Administrative Accounting, overseeing that office, as well as Payroll and Telephone Services, and in 1999, she was named associate vice president for Finance and Operations. As associate vice president, she supervises the Administrative Accounting, Payroll and Contract and Grants offices and serves as SHSU’s liaison with ARAMARK food services. Among Gilliam’s retirement plans are traveling and gardening. She and her husband will also move to Buffalo, Texas, to be closer to family. Her last day is April 30. For more information, call the division of Finance and Operations at 936.294.1017. In the past six months, Jim Massey’s political science classes have made a ton of difference for Huntsville’s Good Shepherd Mission. As an extra credit project to give to the needy (both students with poor grades and the less fortunate) for the holidays last semester, Massey offered his students bonus points for those who brought in items for a food drive. After his four classes collected more than 1,778 pounds of non-perishable food, exceeding his expectations, he decided to continue the project in the spring, he said. Raising the stakes by offering the top collecting class a pizza party, his four spring classes collected 1,824 pounds earlier this month. He and a group of student volunteers delivered the collection on April 11 to a surprised mission staff. Massey said the summer months tend to be lean with regards to donations for the needy, and a project such as this one is a great opportunity to show SHSU’s students the importance of community service. The pizza party, which will be held on May 2, was awarded to Massey’s 11 a.m. class, which brought in 789 pounds of food in one day. “I couldn't be more proud of all of my students for the effort they have made in making a real difference in the lives of many of Huntsville's needy,” he said. SHSU's Political Science Junior Fellows presented a $1,350 check to the Huntsville YMCA after their first "Democrat vs. Republican Flag Football Game" on April 19. SHSU Republicans made a statement that wasn’t political on Saturday (April 19) when they won the Political Science Junior Fellows’ first “Democrat vs. Republican Flag Football Game” 70-63. 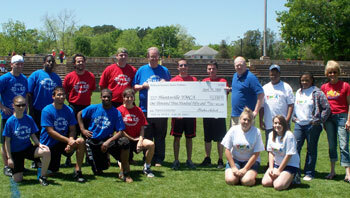 After the first five-on-five contest, participants from both teams came together to present a $1,350 check to the Huntsville YMCA, 90 percent of which came from donations by junior fellows members, according to Mike Yawn, PSJF adviser. Held at Pritchett Field, the event was a fun way to “encourage civic engagement among students, promote cooperation between Republicans and Democrats, and help out a local non-profit organization,” according to junior fellows vice president Blake Holub. “During an especially heated election year, this is a good opportunity for the parties to come together for a charitable cause and the good of the community,” said Russell Martinez, chair of the Walker County Republican party, which, along with the Walker County Democratic party, also supported the event. Teams were comprised of junior fellows and Party members, including Martinez, Ryan Dalton, Vesna Markovic, Jonathan Holland, and Blake Holub for the Republican team, and Beau Harris, Amanda Carter, Matt McClellan, Blake Roach, and Sam Roberson for the Democrat team. Yawn played quarterback for both teams, and Walker County Democratic Party chair and interim chair of SHSU’s political science department John Holcombe serving as the honorary coach of the Democratic team. SHSU will become the home of the Southwest Council Of Latin American Studies after it recently won the bid to host the organization’s executive directorship. The organization will be housed in the College of Humanities and Social Sciences, though the foreign languages department. For the next five years, Rafael Saumell-Munoz will serve as executive director, Enrique Mallen will serve as webmaster and Debra Andrist will continue to serve as editor of the bulletin/boletín. All three are Spanish professors. SCOLAS is an organization that supports scholarship and the exchange of ideas on all facets of Latin American studies, according to Andrist, who is also chair of the foreign languages department. It has been housed at Baylor University, and the transitional period, during which the directorate moves to SHSU and the professors become acclimated with their duties, will end and SHSU will take over sole responsibility after the March 2009 Santo Domingo conference, Andrist said. As the SCHOLAS director, SHSU will sponsor panels on music, art, literature, business and general culture. For more information, contact Andrist at andrist@shsu.edu or 936.294.1441. Senior theatre major Scott McCarrey was selected as the winner of the “O’Neill National Critics Institute Scholarship” award during the 40th annual Kennedy Center American College Theater Festival April 14-20. As the national winner, McCarrey received a full scholarship to attend the Eugene O’Neill Theatre Center in Waterford, Conn., during its national playwrights’ conference in July, working with leading professional newspaper and magazine critics from across the United States. For the competition, nominated students were asked during the regional festival to write critiques of a selected number of plays. Eight regional finalists, including McCarrey, were selected to attend the KCACTF National Festival in Washington, D.C., to participate in a series of master classes and symposia on dramaturgy and theater criticism. The KCACTF brings together selected participants from eight regional festivals at colleges and universities across the country to showcase their talents at the nation’s center for the performing arts, to be considered for and to receive scholarships and awards and to participate in master classes with some of the best artists in their field. SHSU hosted the Region VI festival for the first time in Huntsville Feb. 26 through March 1. Assistant professor of Spanish Alejandro Latínez will spend time this summer in Mexico and Tennessee studying the works of “one of the most impressive Mexican painters of his time,” Abraham Angel. Funded through SHSU’s Enhancement Grant for Professional Development 2008 Internal Grant, Latínez’s study on "Subtle Canvases: Androgyny and National Identity in Abraham Angel's Art" will address the depiction of gender and its relationship with national identity during the first two decades of the Mexican revolution. “A topic of particular significance to Latin American culture is the relationship between social revolutions and the arts,” he said. “This interest opens up an enormous amount of ideological debate and competing narratives about the characteristic of the art that would represent the identity and embodiment of the new society and individual, debates that include—implicitly or explicitly—a definition on gender." “His (Angel’s) painting depicting androgynous figures in the midst of rural Mexican landscapes suggests a particular narrative in a context in which mural painting is taking the central stage of the official scenario,” Latínez said. To do so, Latínez will analyze materials and resources on Angel’s art and life, in Mexico at the Museo de Arte Moderno, the Hemeroteca Nacional, and the Instituto Nacional de Bellas Artes; as well as at the Museum of Fine Arts in Houston and the library of Vanderbilt University, among others.